Paris officials: Suspected attacker 'downed' after driving into police car on Champs-Elysees. PARIS (AP) — A man on the radar of French authorities for extremism was killed Monday after ramming a car carrying arms and explosives into a police convoy on Paris' famed Champs-Elysees Avenue, setting off a fiery blast and a cloud of orange smoke, officials said. France's anti-terrorism prosecutor opened an investigation. Gendarmes jumped out of the vehicle, ran to the car, smashed its windows and pulled out the driver in an apparent attempt to save him, according to witness accounts. The interior minister confirmed that he died. 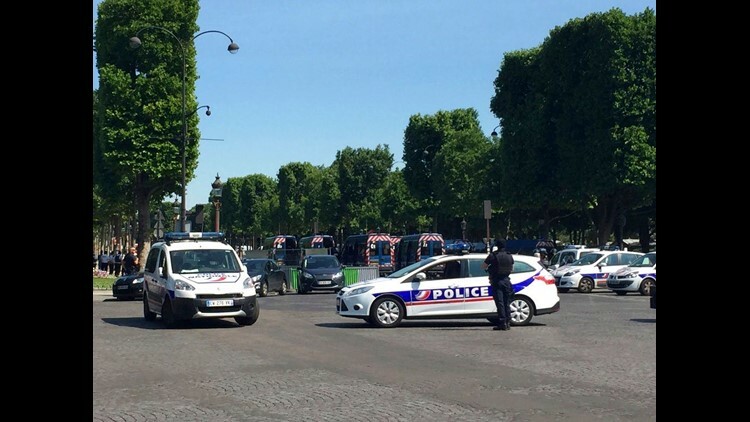 No one else was injured despite the crowds of tourists and others walking down the avenue on a hot, sunny day, the Paris police department said. Interior Minister Gerard Collomb called it an "attempted attack" and said it "shows once again that the threat level in France is extremely high." The minister used the occasion to explain the continued need for a state of emergency, in place since 2015, and plans to extend it until Nov. 1, to be presented at a Cabinet meeting Wednesday. A man could be seen lying on his stomach on the ground immediately after the incident, wearing a white shirt and dark shorts. The body was kept out of view under a tent, and later police were seen removing it, in a body bag on a stretcher. If confirmed as a deliberate attack, this would be the fifth time this year that police forces have been targeted around the French capital. Noemie Pfister, walking with her infant child and a friend, said she saw a car fly past a column of police vans, then fishtail. She wasn't sure if she saw it ram into one of the vehicles because it happened so quickly, but she can't forget the smoke and flames. "I saw gendarmes get out of a van, run, break the window" of the car, she said in an interview. "They took the man out and put him a bit further away (from the car) on the other side of the road," she recalled. "I couldn't understand, but I find it really strange that a car would pass (police) vans and all of a sudden spit fire," said Pfister. "I thought in my mind of an attack." Leonard Odihe said he saw officers break into the car, pull the man out and throw two weapons on the ground, "a big pistol and another big arm like the weapons police carry." Odihe said he also saw bottles of gas, one of which apparently exploded inside the car. Two police officials told The Associated Press that a handgun was found on the driver, who they said was badly burned after the vehicle exploded. They identified him as a 31-year-old man from the Paris suburb of Argenteuil who had an "S'' file, meaning he was flagged for links to extremism. The interior minister said the current situation in France shows a new security law he is to present is needed to eventually "maintain a high security level" without the state of emergency. Earlier this month, an attacker on foot went after a police patrol with a hammer in front of Notre Dame Cathedral. In April, an attacker opened fire on a police van on the Champs Elysees, killing one officer and gravely wounding two others. The attacker was shot dead by police. That incident recalled two other attacks on soldiers providing security at prominent locations around Paris, one at the Louvre museum in February and one at Orly airport in March. Sylvie Corbet, Angela Charlton, Oleg Cetinic and Christophe Schopoliansky contributed.